Enjoy the perks of a newbuild with this freshly remodeled home nestled in the Ahwatukee foothills. 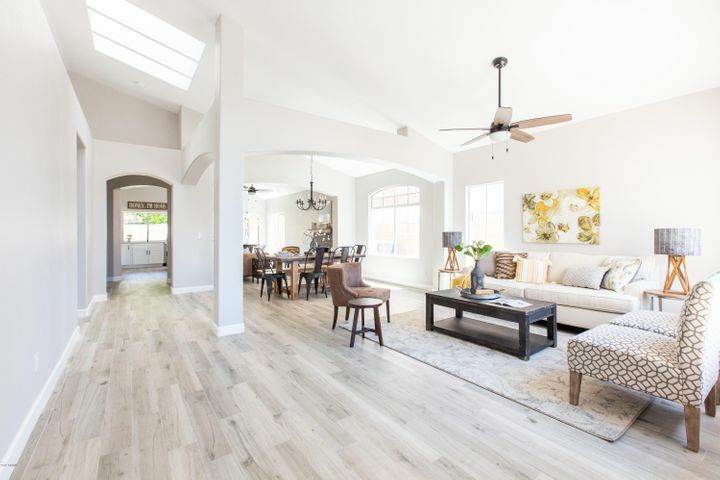 Featuring a wide-open floor plan, this home has been tastefully updated top to bottom with all new flooring, lighting, and interior paint in neutral colors to incorporate any decor style. Both bathrooms feature new vanities and all new fixtures with custom tiling and an expanded shower added in the master. Brand new cabinets, stainless steel appliances and quartz counter tops complete this move in ready home in an established golfing community. Keep cool with ceiling fans throughout and a high efficiency air conditioning system replaced in 2017. Wonderful location near the new 202 expansion freeway, foothills restaurants and A+ rated schools! Don't wait, this one will go fast! © 2019 Arizona Regional Multiple Listing Service, Inc. All rights reserved. The data relating to real estate for sale on this website comes in part from the Arizona Regional Multiple Listing Service. Real estate listings held by brokerage firms other than Phoenix Urban Spaces, LLC are marked with the Arizona Regional Multiple Listing Service logo and detailed information about them includes the name of the listing brokers. All information should be verified by the recipient and none is guaranteed as accurate by ARMLS. All properties are subject to prior sale, change or withdrawal. Neither listing broker(s) nor Phoenix Urban Spaces, LLC shall be responsible for any typographical errors, misinformation, misprints and shall be held totally harmless. Listing courtesy of Century 21 Arizona Foothills. Listing data last updated Friday, April 26th, 2019 12:05:18 AM.